Atrial fibrillation (AF) is the most common persistent cardiac dysrhythmia and the number one cause of arrhythmia-related hospitalizations. In addition, AF is a major contributor to stroke. With life expectancies increasing, the growing global disability from AF has crippling implications for society. Several family studies have shown a strong polygenetic predisposition for AF but, so far, most of the linkage analysis and candidate gene studies have discovered only monogenic, rare, deleterious mutations. Recent breakthroughs in high-throughput genotyping technology have allowed improved scanning of the genome with greater statistical power to detect susceptibility alleles for AF. Using this technology, a region on 4q25 has now been identified and validated in thousands of cases as a common susceptibility factor for AF with an odds ratio of over 3.0 for homozygotes. The Paired-like homeodomain transcription factor 2 (PITX2) gene, which is involved in embryonic cardiac development, has now been identified as the causal variant for the 4q25 susceptibility locus. Additional susceptibility variants are anticipated that will have direct ramifications for prognosis and treatment of this highly pervasive and clinically significant disorder. Atrial fibrillation (AF) has an enormous societal impact because of its very high incidence, its potential for devastating clinical consequences, the difficulty of its management and its associated financial burdens [1–4]. It is the most common persistent cardiac dysrhythmia and also the most common cause of arrhythmia-related hospitalizations [5, 6]. The relative risk of death for people with AF is over 20% higher per year than that of age-matched controls, with stroke accounting for the majority of that greater risk . Currently, it is estimated that AF affects approximately 2.3 million people in the United States, with an expected fivefold increase in prevalence by 2050 . With life expectancies increasing in both developed and developing countries, the growing global disability and financial burden of AF has crippling implications for society. Given these projections, new strategies are desperately needed to prevent and better treat AF. Over the past 2 years, there has been an unprecedented series of genomic findings giving us considerable insight into the underpinnings of the most common diseases, including diabetes mellitus, myocardial infarction, various types of cancer and AF . Here, we review the recent advances in the genetics of AF and suggest routes towards an individualized medical approach. Hypertension, heart failure, advanced age and diabetes are well known risk factors for AF [9, 10]. However, significant proportions of patients, up to 30% in some large studies, develop AF in the absence of these factors ('lone' AF) [11, 12]. Furthermore, multivariable modeling has shown that AF, particularly if premature in onset, more than triples the risk of future disease in offspring . Evidence for even stronger heritability is seen in those with a first-degree relative diagnosed with lone AF before the age of 60; these patients were five times more likely to develop AF than the general population [14, 15]. Despite the abundance of data implicating a genetic basis of AF, we have been unsuccessful in fully delineating its pathobiology. Several studies have identified rare, deleterious 'private' mutations resulting in familial AF [16–21]. However, these variants provide little, if any, explanation for the common AF phenotype [22, 23]. Like diabetes and obesity, AF is a complex trait involving multiple genetic and environmental factors [24, 25]. Earlier methods used in scanning the genome for susceptibility markers for AF relied chiefly on linkage studies using microsatellite markers (short tandem repeat sequences) . This approach required the laborious accrual of hundreds of family members with affected and unaffected siblings. Subsequently, using 400 microsatellite markers distributed evenly across the genome every 10 centimorgans (or approximately every 10 million base pairs), the genomes were systematically assessed to search for a 'linkage peak' or extensive allele sharing. Such a linkage peak would indicate that a causal gene was near or perhaps in linkage disequilibrium (LD; inherited as a block without recombination) with the microsatellite marker. However, identifying a causal locus interspersed over a million base pairs has proven to be difficult, as evidenced by the limited replication of genomic associations discovered through this process . In the past 2 years, however, there have been dramatic advances in high-throughput genotyping, allowing much greater statistical power when searching for susceptibility loci . First, large-scale efforts have led to the identification of the approximately 11 million base pairs that commonly vary among individuals. These single nucleotide polymorphisms (SNPs) represent approximately 0.3% of the total genome but account for the majority of human genetic variation. Second, we have found that these base pairs are not inherited independently, but as 'units' or 'bins' that are in LD with disease-causing alleles. This advance has served as our 'global positioning system' by enhancing our ability to home in on areas of the genome of pathobiological relevance. Moreover, we now know that the genotype of one SNP may be sufficient to infer the genotype of all other SNPs within a given haplotype block, thereby 'tagging' an entire region of interest (Figure 1). The International HapMap project demonstrated that 300,000-500,000 tag SNPs in European or Asian populations or 1.1 million tag SNPs in African individuals of Yoruban descent is sufficient to capture the majority of our common genetic variation (common variants are taken here as those with a greater than 5% minor allele frequency) [28, 29]. Thus, less than 0.03% of all nucleotides comprising the human genome are enough to provide a window to index our biological individuality. 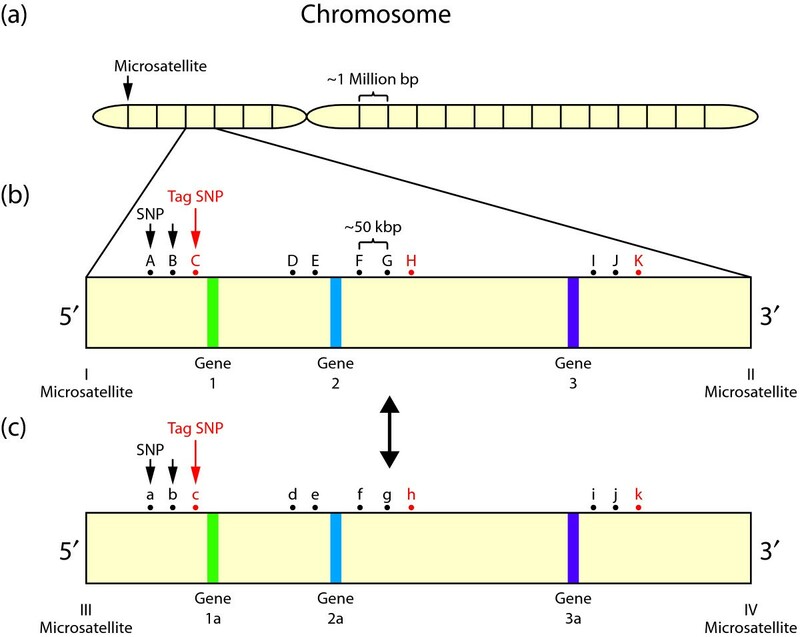 Single nucleotide polymorphisms (SNPs), tag SNPs and microsatellites as genomic markers. (a) An autosome with evenly spaced microsatellites about 1 million base pairs (bp) apart. (b) A segment of DNA between microsatellite markers. SNPs within the segment are indicated by letters. Tag SNPs (C, H and K) travel with other indicated SNPs as blocks (haplotypes) and can serve as a surrogate for these haplotypes and, more importantly, for disease-causing genes in close proximity. (c) DNA segment with alternative alleles and genomic markers of the same genes as in (b). Note that in (b, c) the microsatellite markers are not as close to the genes as the noted SNPs are. Reprinted with permission from . Another distinct advantage provided by using tag SNPs in high-throughput genotyping includes the ability to recruit sporadic cases of AF in a cohort instead of sibling-pairs or 'multiplex' families . Rapid accumulation of tens of thousands of sporadic cases for establishing associations of alleles with complex traits has dramatically increased the specificity, accuracy and reproducibility of findings. So far, genetic susceptibility for over 40 common diseases has been identified and validated in the last two years using these techniques . In 1997, Brugada and colleagues  reported the first chromosomal susceptibility locus (10q22-q24) for familial autosomal dominant AF in three families using linkage analysis. Subsequently, using a candidate gene approach, one possible gene was identified: DLG5 (discs large homolog 5) . Efforts thus far have not validated this susceptibility locus. Ellinor et al. had similar difficulty in identifying a causative gene in 34 members of a family with autosomal dominant AF mapping to susceptibility locus 6q14-16 . Multiple mutations involving potassium-channel genes have been associated with familial AF [18, 19, 32]. Chen and colleagues , while studying a four-generation Chinese family, identified a mutation in the first transmembrane-spanning domain of the potassium channel gene KCNQ1. This gain-of-function mutation resulted in increased K+ current density . Mutations in other regions of this gene have also been documented in the long QT syndrome type 1 (LQT1) . Subsequently, several other potassium rectifier current gene mutations were identified, including KCNE2, KCNJ2 and KCNH2 (Table 1) [18, 19, 32, 35]. These genes all have gain-of-function phenotypes that result in shortening of the action potential duration (APD); this shortening predisposes atrial tissue to reentrant arrhythmias - a hypothesized major cause of AF generation and propagation [36, 37]. Certainly, positive effects from class III anti-arrhythmics, such as amiodarone and the recently approved dronaderone, which lengthen APD and maintain sinus rhythm, support this hypothesis . Abbreviations: ACE, angiotensin converting enzyme; AF, atrial fibrillation; ANP, atrial natriuretic peptide; APD, action potential duration; NPC, nuclear pore complex. Recently, Chen et al. studied 157 unrelated patients with lone AF and 314 matched controls using a candidate gene approach. A common loss-of-function H558R mutation was identified in the SCN5A gene conferring an odds ratio (OR) of 1.6. The at-risk allele was present in 30% of cases but in only 21% of controls (P = 0.002). The decreased sodium current associated with this mutation affects phase 0 of the cardiac action potential, creating a shorter wavelength of conduction velocity and potentially more stable AF. One of the most elegant studies of AF  ever conducted used functional genomics to study a rare autosomal recessive mutation on 5p13 linked to neonatal AF and sudden death . Using fine mapping, the authors  identified a homozygous mutation, R391H, in the nucleoporin 155 gene (NUP155). Nucleoporins are part of the nuclear pore complex (NPC),which is an evolutionary conserved structure serving as a highway for transport of mRNA’s and proteins between the nucleus and cytoplasm . Homozygous knockout mice (nup155-/-) died during embryogenesis, whereas heterozygous mice had AF and showed expression levels of mouse nup155 mRNA and protein that were less than half the wild-type levels (a statistically significant reduction). Furthermore, nup155+/- mice showed significantly reduced export of heat shock protein 70 (hsp70) - a protein vital to cellular viability - confirming a dysfunctional NPC. This is the first study to link the NPC to cardiovascular disease. Investigation of the NPC as an etiology for other arrhythmogenic disorders might be worthwhile. Connexin 40 is a gap junction protein expressed selectively in atrial myocytes that mediates coordinated electrical activity in the atria [42–44]. Because defects in this protein impair electrical coupling between atrial cells, it is speculated that the resulting conduction heterogeneity might enable AF . In an elegantly conducted study, Gollob et al. identified novel mutations in the connexin 40 gene (GJA5) in resected atrial tissue from patients with lone AF. Interestingly, none of the same mutations isolated from the cardiac tissue were identified in the peripheral blood lymphocytes, indicating the de novo nature of the mutation. This was the first study in AF genetics to use site-specific tissue to identify novel somatic variants. The role of somatic mutations in connexin 40 needs to be further validated, as 11 of the 15 patients did not show the mutation at the tissue level. Two hormonal genes critically interlaced with various facets of the cardiovascular system were recently implicated in AF [45–47]. Hodgson-Zingman et al. mapped a susceptibility locus in a family with 11 clinically affected members to 1p36-p35. This heterozygous variant resulted in a frameshift mutation in the gene encoding natriuretic peptide precursor A (NPPA), which also encodes atrial natriuretic peptide (ANP). Through stimulation of cyclic GMP, ANP has a vital role in the regulation of intravascular blood volume and vascular tone through natriuresis, diuresis and vasodilation . ANP also modulates currents of sodium, calcium and potassium channels in cardiac myocytes . The frameshift mutation abolishes the stop codon and extends the reading frame. The resulting protein shortens atrial monophasic action potentials in an isolated whole-heart animal model, which provides a plausible hypothesis for its role in AF . An association between genetic polymorphisms in genes of the renin-angiotensin system and nonfamilial AF has also been reported . Using a candidate gene approach, Tsai and colleagues  demonstrated an increased risk of AF in 250 patients with nonvalvular AF. Three polymorphisms in the angiotensin converting enzyme, angiotensinogen and angiotensin II type I receptor genes were implicated, with ORs for all three being between 2.0 and 3.3. The effects were not additive. The renin-angiotensin system has previously been shown to induce atrial fibrosis, which increases conduction heterogeneity and facilitates reentrant arrhythmias [45, 49]. Genes believed to mediate inflammation are now also being found to segregate with AF . In one small series, SNPs in the endothelial nitric oxide synthase gene and the minK 38G variant were shown to be synergistic in their risk for AF (OR 2.11) . A single polymorphism in the matrix metalloproteinase-2 (MMP2) gene and an A592 polymorphism of the interleukin-10 gene were also significantly associated with AF in another small series . The potential pathobiology of inflammation-induced AF is currently being explored. Recently, using high-throughput SNP genotyping, Gudbjartsson and colleagues  performed a genome-wide association study (GWAS) of over 300,000 SNPs in over 4,000 AF cases and 20,000 controls across four independent European and Han Chinese populations. Three SNPs in the same LD block on chromosome 4q25 strongly correlated with AF (P = 2.1 × 10-9, 1.6 × 10-10 and 1.9 × 10-9). Approximately 35% of Europeans and 52% of Chinese people are known to carry at least one of these variants, but no individual was noted to have all three variants, indicating an embryonic lethal combination. Strikingly, the ORs for European and Chinese individuals homozygous for one variant, the rs2200733T allele, were 3.64 and 1.7, respectively. So far, these are some of the highest ORs documented for complex trait susceptibility using genome-wide SNP association technology. Kääb and colleagues have recently reproduced this AF susceptibility locus in 4 additional cohorts . Currently, there is no known annotated gene present in the LD block containing the SNPs identified on 4q25. However, recent data strongly implicate the PITX2 (Paired-like homeodomain transcription factor 2) gene in the immediate upstream block as the causative agent . Chung et al. conducted a GWAS using 200,000 SNPs in 138 AF cases and 546 controls. A single SNP (rs4611994) in the same LD block on 4q25 met genome-wide significance and was again genotyped in 46 left atrial appendage tissue samples, with PITX2 expression levels also obtained. This analysis demonstrated a significant association of the rs4611994 genotype with the C isoform of PITX2. PITX2 is an interesting candidate gene for AF susceptibility given that it is known to act in cardiac development by directing asymmetric morphogenesis of the heart . 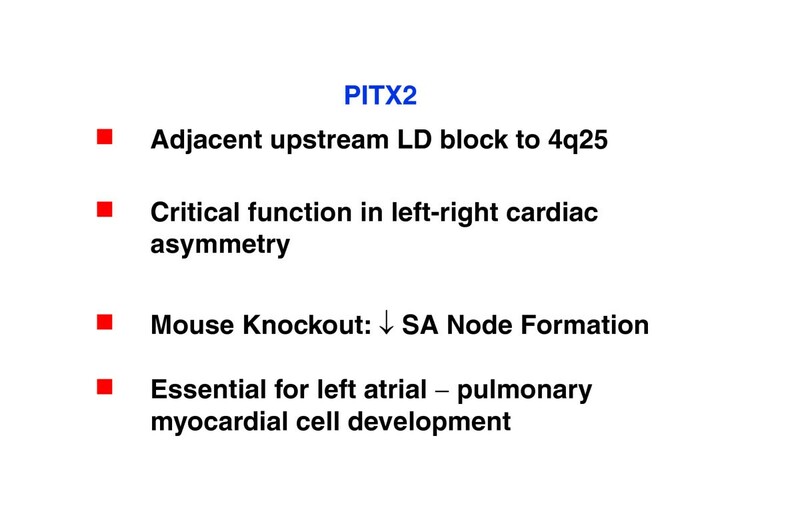 Knockout models of pitx2 in mice have been shown to inhibit sinoatrial node formation in the left atrium. (Figure 2). Recently, PITX2 was also demonstrated to be necessary for the development of the pulmonary myocardium, the sleeve of cardiomyocytes that extends from the left atrium to the initial portion of the pulmonary vein . This area has been implicated as a source for the ectopic atrial activity necessary for the initiation and propagation of AF . Appropriate gene therapy early in life in patients with the PITX2 variant might prevent early-onset AF. Functional genomics of PITX2 susceptibility variants in AF. SA, sinoatrial. A recent GWAS on ischemic stroke patients yielded striking results . Over 300,000 SNPs were analyzed in approximately 5,000 ischemic stroke cases and over 30,000 controls. Surprisingly, the authors  found that the SNP on 4q25 previously reported to be associated with AF also segregated with ischemic stroke, and specifically the cardioembolic and cryptogenic subtype of ischemic stroke (ORs 1.54 and 1.23). This highlights the role of AF as a root cause of stroke in a significant proportion of patients. The role of AF in stroke was further confirmed recently when data from mobile telemetry units showed brief runs of AF in over 25% of patients diagnosed with cryptogenic stroke . Thus, for the first time, a GWAS has not only identified a region of the genome associated with a disease, ischemic stroke, but has also shed light on another disease, AF, with immediate and direct ramifications for treatment strategies. 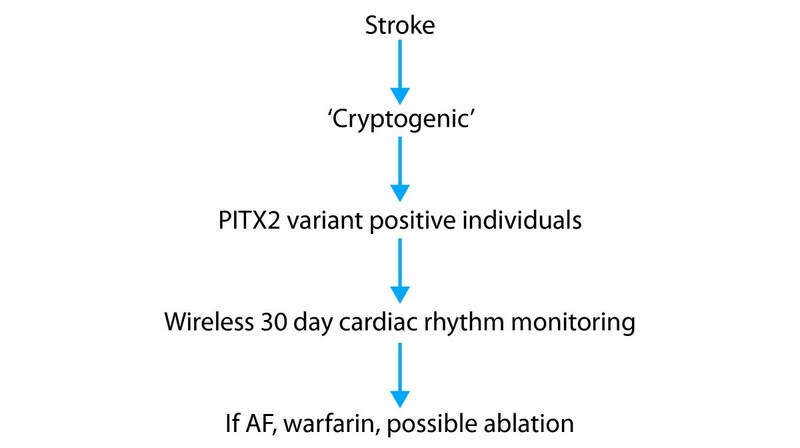 An appropriate genomically informed approach might be to assess the status of common variants of PITX2 in all patients with cryptogenic stroke followed by telemetry monitoring and anticoagulation in those at risk (Figure 3). A pharmacological approach to the potassium channelopathy could potentially be developed to promote gene-specific, individualized prevention. Such a strategy would serve as a reference standard on how to use human genomics to tailor therapy to each patient's biological makeup. A genomically informed approach for treatment of AF in cryptogenic stroke. The chain of discoveries in complex trait genomics uncovered over the past 2 years using genome-wide association technology is unprecedented . Currently, susceptibility markers for over 70 diseases have been identified and additional variants are anticipated for many cancers, and cardiovascular and neurological diseases. Collectively, these studies have the potential to change the practice of medicine radically. However, there are several areas of the genome that still need to be explored and that probably have a significant role in explaining the heritability of many common diseases . Specifically, structural variants including insertion-deletions (indels), block substitutions, inversions and copy number variants have recently been shown to account for at least 20% of all genetic variation in humans. Such variants are only now being investigated. So far, GWASs have focused on only SNP variants with a minor allele frequency of over 5%. However, given the relatively modest odds ratios seen recently with common polymorphisms, it is very likely that rare variants confer a substantial risk or protection from disease. Such was the case with rare type 1 diabetes loci that were recently found to halve the risk for developing the disease . Only large-scale resequencing of the genome will enable the discovery of these low-frequency variants, which would otherwise be missed. Another challenge will be to show, through well designed prospective studies, that new susceptibility variants offer incremental value in screening and treatment over traditional standards . Such studies will be of utmost importance given that additional common, rare and structural variations predisposing us to common diseases are likely to surface rapidly in the near future. We also must be aware that alleles conferring susceptibility in those of European descent might be protective or not confer any risk in those of other ancestries. Only through comprehensive study of heterogeneous populations will we be able to fully define the genetics of complex trait predisposition . Finally, appropriate phenotypic expression, metabolomic and proteomic studies will be vital in elucidating the functional genomics of susceptibility variants. The aggregate result of the above efforts will hopefully propel us into an era of medicine in which we no longer use a 'shotgun' approach in treatment of our most common and burdensome diseases, but instead use a particularized approach made specifically for the individual patient based on his or her unique pathobiology.